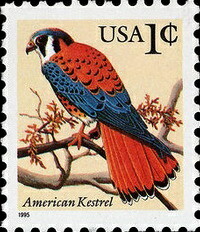 Animal stamps were among the first stamps issued that did not bear the likeness of a monarch or president. Probably the first nation to split from the traditional portrait of the monarch or the nation's coat of arms as the design for postage stamps was Canada, as their first stamp was published in 1851 and had as its core theme a beaver. Collecting animal stamps provides a fascinating area for the young person and the nature lover. I remember the collection constructed by Carla Pelander, one of the more charming and captivating people I've ever known. Carla was only 8 years old when I first observed her standing before an audience of adults displaying and describing her collection of bird and animal stamps. Young as she was she kept her audience enthralled as she turned over the album pages and told her story of each individual stamp which had been presented to her by her - "hunters." The first few pages of her bird and animal stamps collection had the signatures of the "hunters," including all of the notable names of stamp collecting and many, many others. Each hunter to earn the right to sign her album by offering the collection with animal stamps not previously included. To have known Carla was to have known one of the good people of the planet. Anywhere she went persons asked her to exhibit her collection and deliver her lecture. Anytime she did, her audience sat enthralled. She was a wonderful stamp collector. Her life was snuffed out by a terrible disease within two years after I 1st met her, nevertheless she continues to be in my memory and in the memories of all who knew her as one of the truly great stamp collectors. What Carla did with her animal stamps collection others have adopted.